Although far more people walk than in any American city I know – pedestrian friendly is an alien concept in Asian consciousness. Sidewalks do exist but, even if they are wide, nearly every square meter is occupied by vendors or motor bikes using the space as parking lots. Congestion on these sidewalks frequently made me use the street sharing the often narrow space with cars, trucks, motor bikes and other forms of public transportation in a devil-may-care free-for-all. To cross the street a pedestrian simply crosses the street into the traffic which on the many 2-way streets or 3-street intersections comes from all directions. Although daunting at first, this is exactly what the on-coming traffic expects as it, usually, avoids both pedestrians and other vehicles with deft agility. The gentleman’s response to Michael Caine’s question was not flippant. 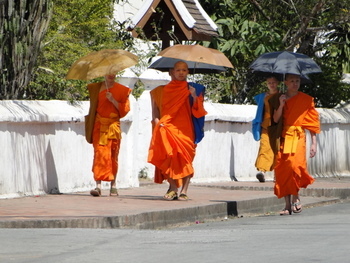 It takes a sturdy centeredness gained through Buddhism, or tenacity, to calmly sense the correct timing and enter the traffic. 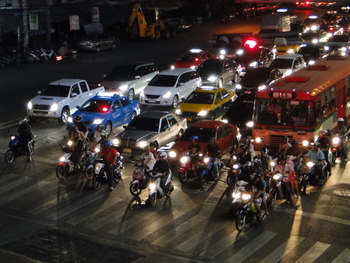 The worst action a pedestrian can take is to get spooked and hesitate halfway across several lanes of traffic – that’s when the cars and motor bikes get spooked and accidents occur. I knew none of this when I arrived in Bangkok. 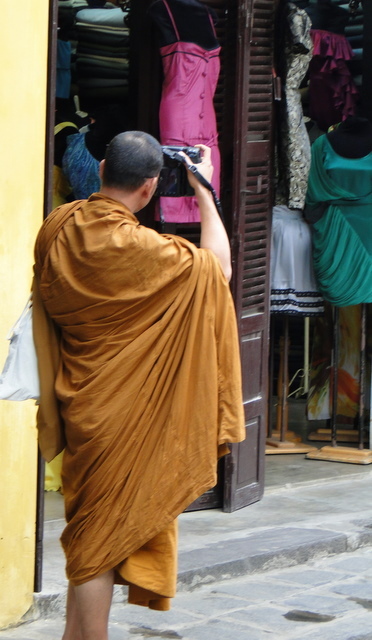 Six weeks later, leaving Saigon, perhaps I’d become a Buddhist as I simply spent no more than a ½-second contemplating my move across the street. My wife, on the other hand, followed Michael Caine’s plan of action, “We looked for groups of Buddhist, inserted ourselves into the very center of them and crossed when they did. If I was going to be mowed down, at least I’d be in the right company.” * Except Jill looked for any vendor pulling (yes, pulling) a cart – frequently old women – and, using them as a human shield, crossed when they did. Was it fun at first? No. Did I react negatively? Yes. 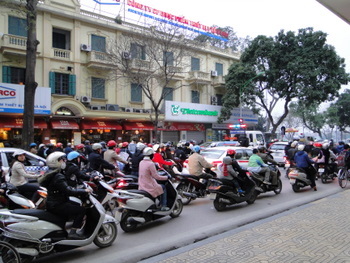 I “threw the finger” at one SUV in Hanoi, after a particularly disappointing meal. He was shocked. After all, he was only going 35/mph 10 feet from me, but I lost my cool and failed to realize he’d never want to splatter me across the street – not as long as the Lord Buddha was watching over us all. The ceiling fan stirs the languid air as mosquitoes flirt in the shadows of verdant ferns and orchids. Roosters compete with motor bikes to break the dawn. The gray/pink haze illuminates the dust laden street with its fading blue and red tin roofed houses. A young man in his 20’s, shirtless, in red shorts, barefoot, opens a creaking gate to drag the motor bike out of the night-time safety of his house. He pauses, takes in the day – a day just like yesterday – the sun will break through and life will steam. I sit on the rattan chair at the small dining table, close to the window away from the fluorescent ceiling lights and their harsh pools of blue/white light. The coffee is black, thick and sweetened with condensed milk, just as everyone in this ancient kingdom likes it – except me. Other guests filter down the wide wooden staircase during the morning. 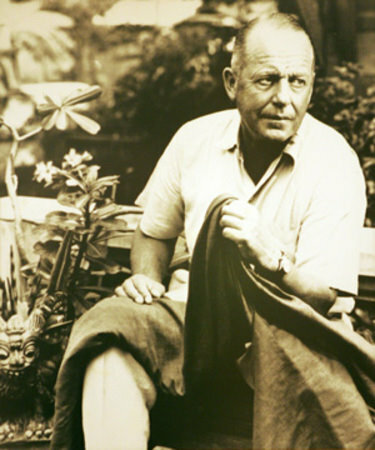 Given the heat, humidity and sugar high from the coffee, I easily imagine a veritable cornucopia of characters from any number of 20th century expat-in-the-tropics novels. The fit German couple in the corner table – early 50’s but have that trekkers’ older look – bussed it overnight from the capital, 12 hours, no air-conditioning. I’ve been warned the overnight busses are not wise – theft, bandits, drivers falling asleep, other accidents. Relaxed they were with their pineapple juice, coffee and toast; they’ve faced worst dangers (?). There’s the eager well-scrubbed English 20-something travel companions planning their one-day schedule to see 14 temples, naive to the toll the jungle will take by temple # 3. The sullen early middle-aged North American couple, skin already too red from the sun, start the day badly due to the eggs (they were oddly undercooked in some sort of fat and sprinkled with ground cinnamon). Yet even though $20/night is nothing to spend on a hotel – ok, weak a/c, weaker WiFi and it’s the third world – it should include… Perhaps he needs to ask the Ta Prohm Strangler what life in the jungle should include. 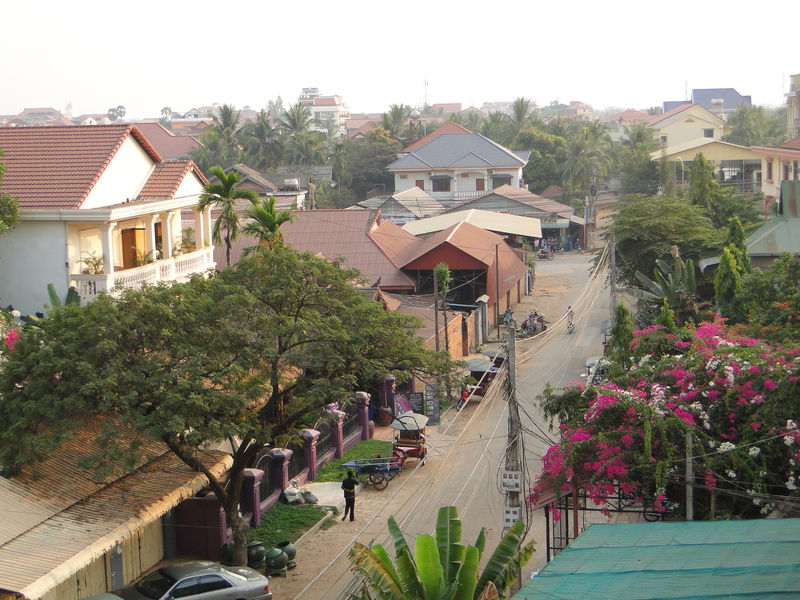 Siem Reap, Cambodia, is not far from the 19th century. Just outside the town are dusty small villages still in that time warp. 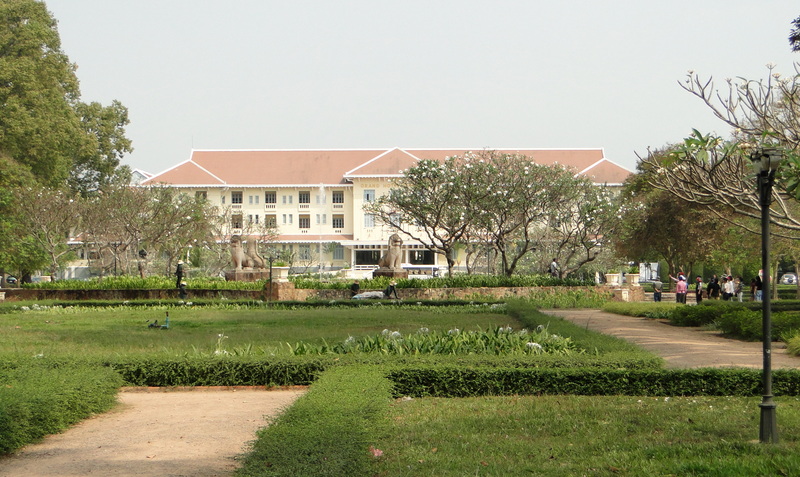 French annexation of the Angkor Wat region over a century ago assured its discovery as one of Earth’s great man-made sites, and Siem Reap developed a modest tourist industry. 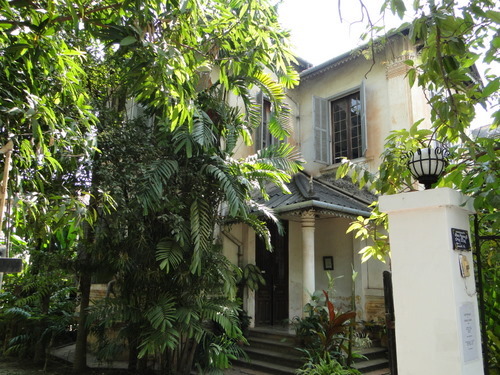 A few elegant hotels, such as the 1929 Grand Hotel d’Ankor, guest houses and a very modest Royal Residence were sprinkled on tree-lined streets in what was just a large village. The survival of Angkor, and Siem Reap, through World War II, the French Indochina War, the Vietnam War, Pol Pot and the civil war (total war years: 1939 -1989) is miraculous although like all urban areas, the town and its population suffered greatly. 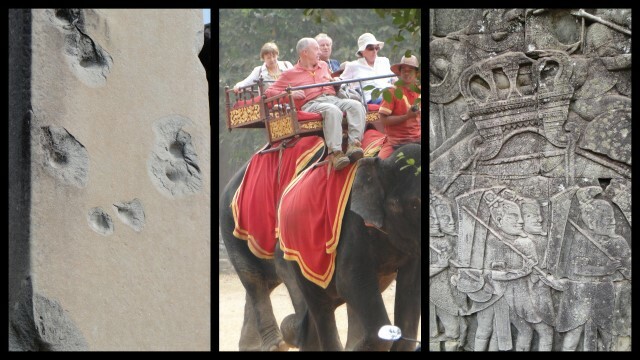 Yet what is Siem Reap without Angkor, what is Angkor without the Khmer Empire, and what is empire without war? 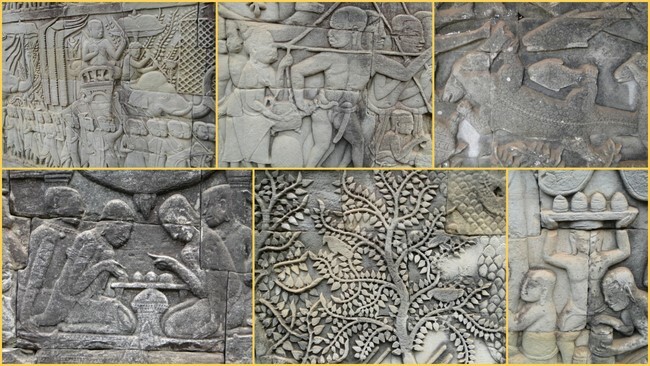 The meters of bas-relief carved on many walls of the over 200 temple complexes at Angkor Thom tell the story that this was the center of an empire – political, military, economic and religious – as well as the home to thousands of people for hundreds of years. 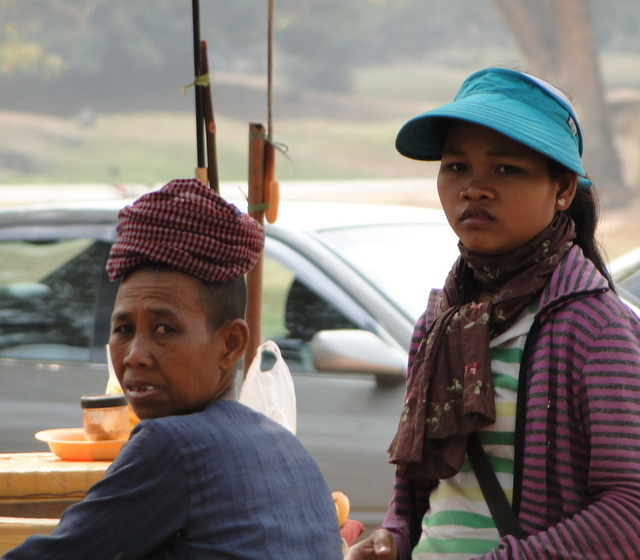 Since 1989, stability under the restored monarchy has made tourism safe again at Angkor. Still, visiting the UNESCO site at night is neither allowed nor advisable. Driving, or even being driven, at night for any long distance in rural areas outside Siem Reap is not a good idea. 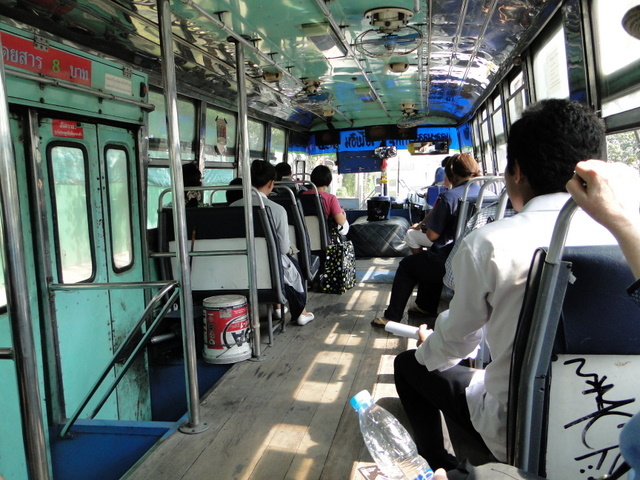 Bus travel to the Lao border a couple hundred miles north can take a full day. It has been this way for hundreds of years, ever since the Khmer Empire moved its capital south and the Ta Prohm Strangler moved in. 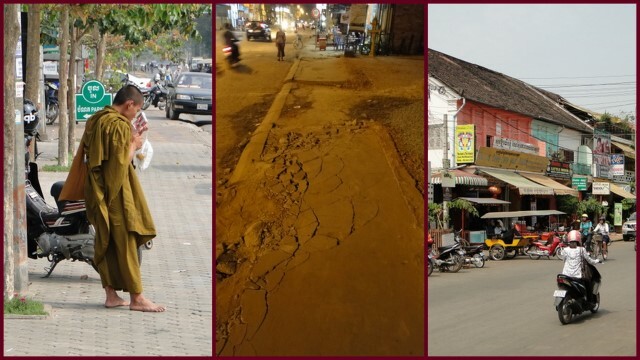 Siem Reap exploded during the last decade developing from a modest town into a chaotic jumble of village/tacky/new high-end without sufficient infrastructure. A new strip of luxury resort hotels, lining the road from the airport to town, seriously serving bus tours, seem incongruous interspersed with rice paddies and no beach. The old French Quarter’s charm is hidden behind questionable electrical lines and examples of exuberant marketing. 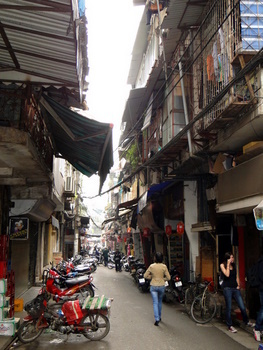 Dusty unpaved roads with small houses and even smaller tailor shops, fruit stands and tall narrow guest houses intersect with a boulevard and the ATM across the street. 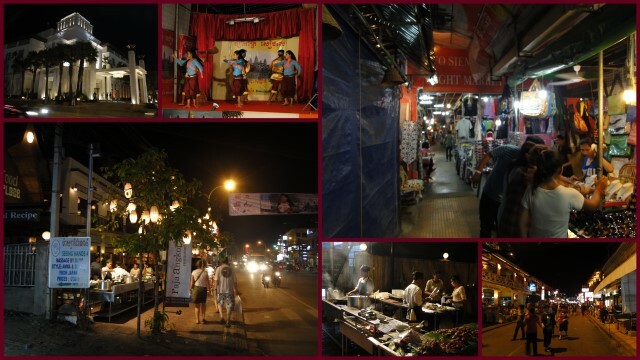 The night-time scene is classic: locals hawking cheap wares while children watch TV on someone’s laptop, “tuk-tuk? 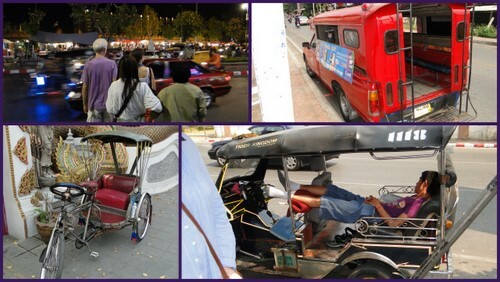 where are you going?” the smells of grilled meat and humid air, music thumping from dozens of open bar/restaurants, “2 dollars foot message?” lights of all shapes and colors illuminating a kaleidoscope of swirling Australians, French and Japanese dodging the motor bikes and tuk-tuks. The gods and demons of ancient Angkor would prefer if Siem Reap was grander, but I’m confident they’d approve the activity – after all, it is once again Cambodia’s cash cow. Could the Strangler be failing? Creating a sustainable economy is difficult in a region both exhausted by strife and whose fame is based on ruins. 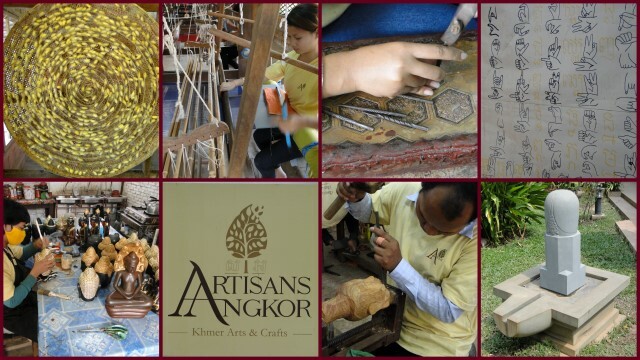 Artisans d’Angkor operates both training facilities and retail outlets for high-end traditional Khmer silk, wood and stone arts and crafts. Training those with special physical needs is part of their mission as well. 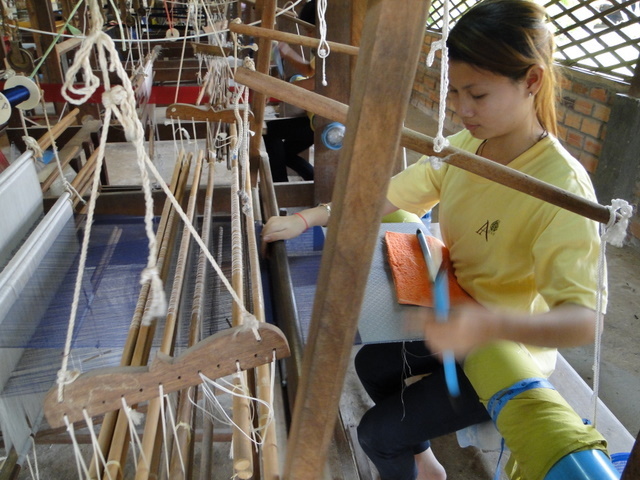 Touring both the craft shops and the silk farm is instructive and a pleasant break from tracking down the Ta Prohm Strangler. 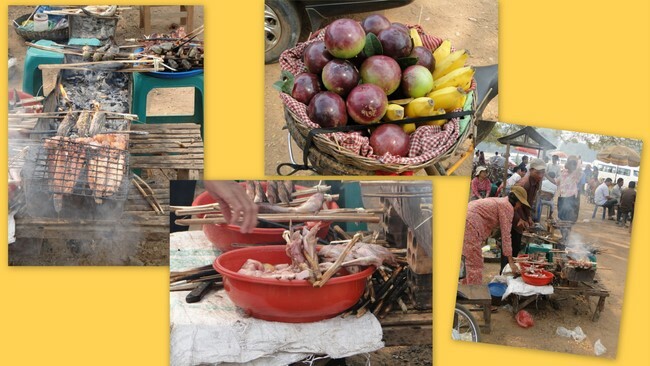 Southeast Asians eat all the time – a grilled banana, nibble fresh pineapple, sip some cane juice, a fresh baked fish in salt, a coke, a few dried strawberries. There’s always food, and no one’s fat. Yet KFC’s here and Australian beef burgers but so are frog’s legs and sautéed freshly picked morning glory greens from the river bank. 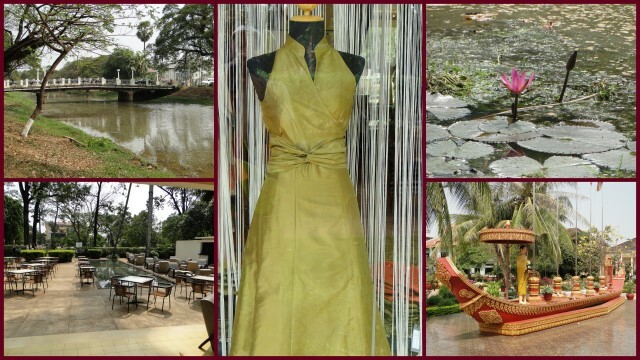 There’s a quiet side, the banks of the Siem Reap River. 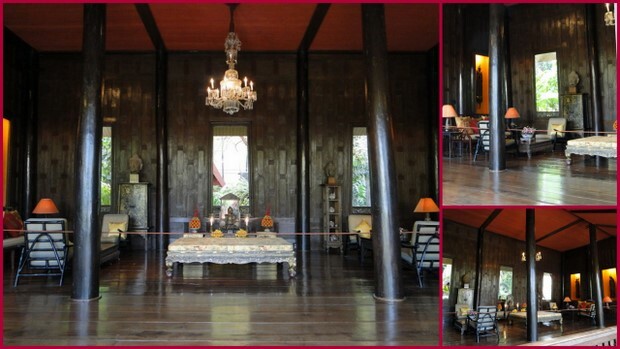 The town’s best restaurant and small hotel, Bopha, is located at 512 Acharsva Street facing the east bank. 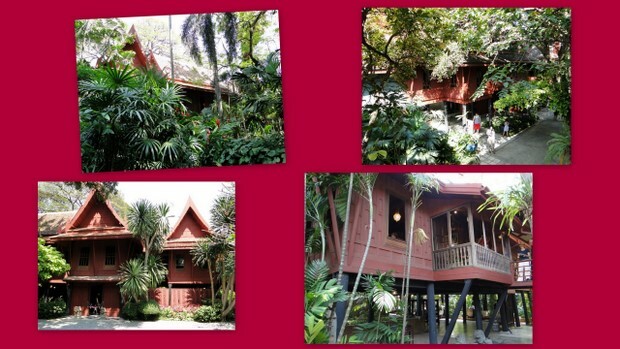 It’s a haven of calm with rooms and the restaurant surrounding and within several lush tropical garden courtyards. 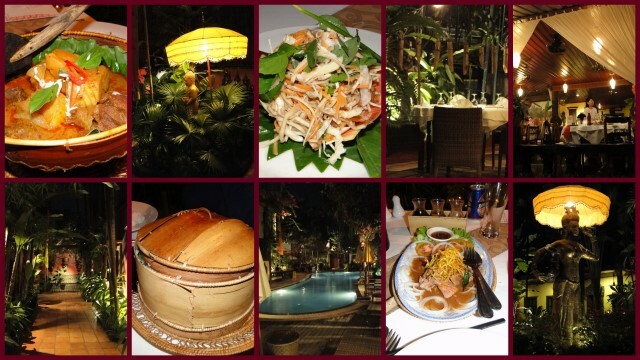 A private pool adds to the relaxation of spending less than $US60/double and US$20/couple for haute Khmer cuisine (US$10-20/wine). 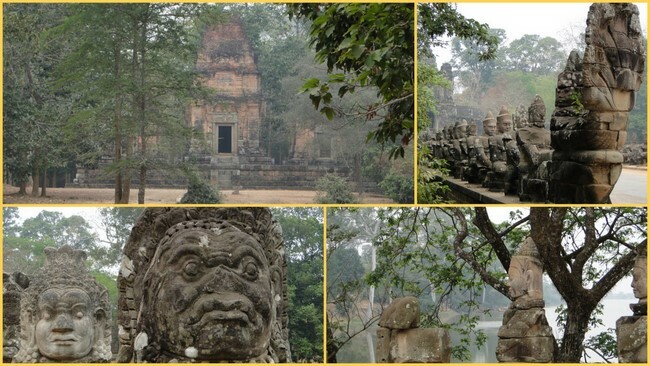 The lure is still the past – the Royal City of Angkor Thom, the vast complex of 243 temple cities once populated with over one million people ruling an empire covering much of present day Southeast Asia. 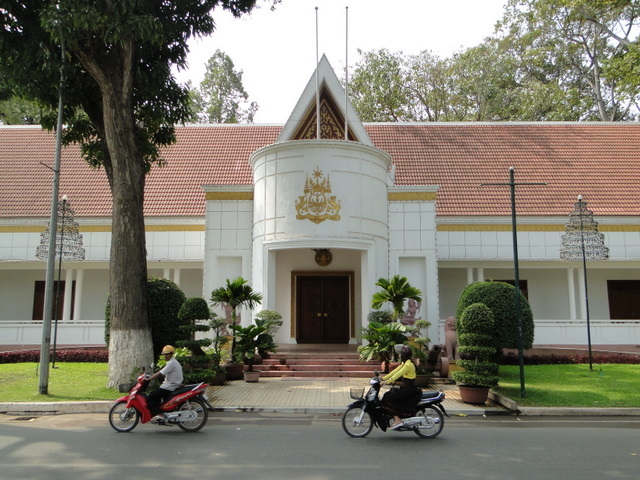 Started by Khmer kings and Hindu priests in the 9th century, reaching its zenith in the 13th as the capital of a Buddhist empire, sacked by the Thais in the 15th century, it has been sustained and ultimately saved by monks from the strangulation of neglect, changing politics, wars and the jungle. The Strangler Fig (strangler vine to the locals) sends dozens of roots deep into the ground around rocks and buildings for hundreds of feet. It encases and crushes whatever it encounters. To kill the vine, all roots must be severed. To restore a temple, the vines must be killed. 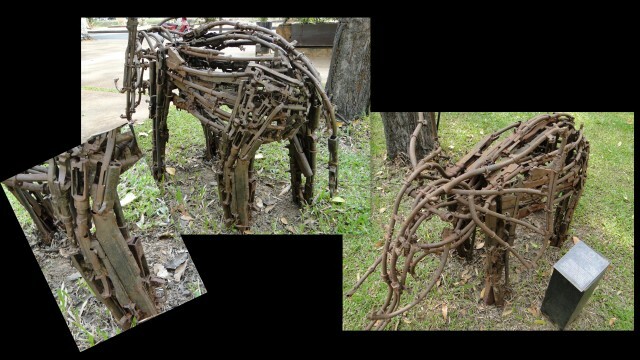 A metaphor for the restored Khmer Kingdom of Cambodia? Can all the destructive roots of the past 500 years be severed and the orderly, yet bloody, grandeur of nationhood be reborn? 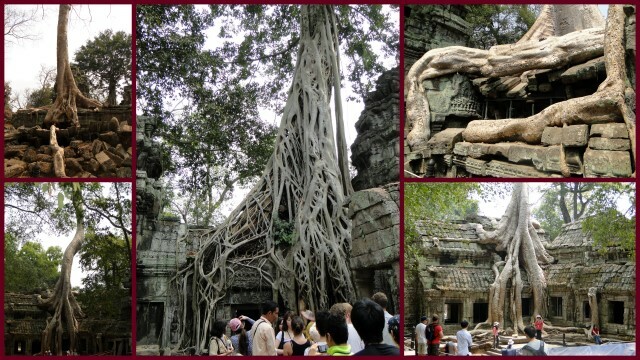 Or will Siem Reap be a new Khmer model: play it day-by-day, see what happens, hope, sweat and keep the Ta Prohm Strangler at bay. Before French imperialism in the 19th and 20th centuries, before the uninvited American intervention during the Vietnam War, before “sainted” President Reagan’s support for the murderous Pol Pot, his reign of horror and the civil war he pursued for a decade after his overthrow in 1979 by Vietnamese forces, there was the glory of the Khmer Empire (9th – 15th century) and it’s capital the Royal City of Angkor Thom. 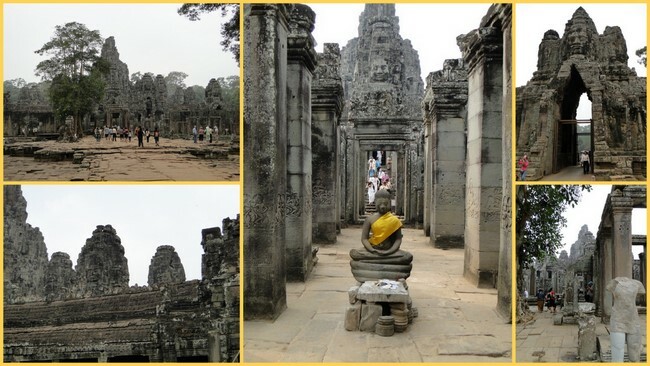 The greatest of the 292 temples that comprise Angkor Thom is the 12th century Angkor Wat constructed during the reign of King Suryavarman II (1112-1150) when the Khmer Empire was at its height dominating most of present day Southeast Asia. The temple complex covers over 200 acres making it the largest religious complex on Earth. It was built to impress. Its outer walls and outer temple are at the end of a 1,000 foot stone causeway over an equally wide 30 feet deep hand dug moat. The inner temple complex is reached by walking on another 1,000 foot raised stone causeway through the vast interior courtyard. To attempt a detailed explanation of Angkor Wat, its architectural significance and the meanings of its intricate bas reliefs requires a text-book. Viewing any of the temples with out arranging for a private guide (US$45-55 for 8-hours, guide and driver) would be a waste of time. 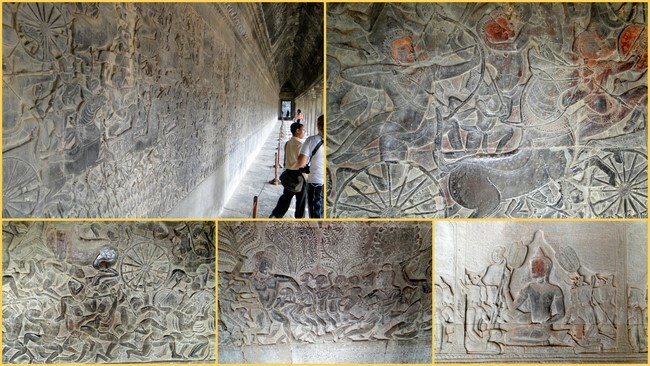 The bas reliefs of Angkor Wat are the largest in the world covering dozens of walls hundreds of feet in length and 12 – 15 feet in height. 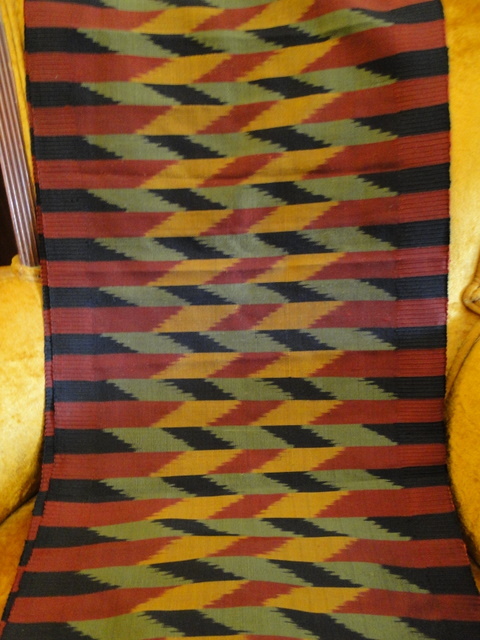 They are in stunning condition. 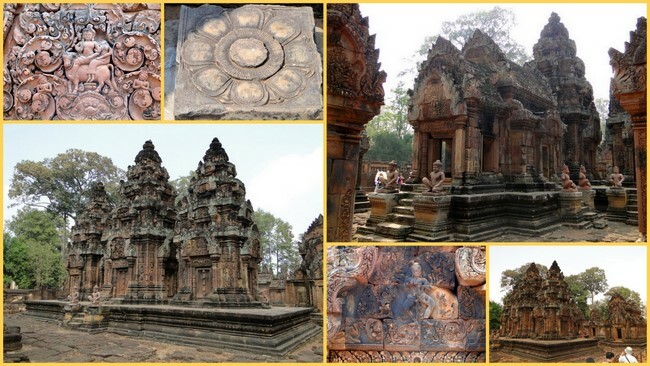 Both carved into solid sandstone and covered from the elements over the centuries they tell the stories of Khmer glory and the religious texts of Hinduism in excruciating detail. Many are horizontal tryptics: royal life/battles top third, everyday life middle third and the ocean or hell on the bottom third. 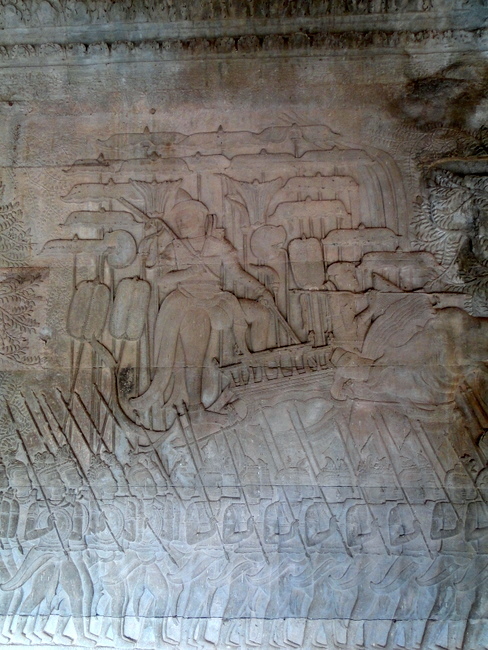 King Suryavarman II is depicted (picture below) riding in triumph on an elephant covered with the 15 umbrellas that signify his rank as god-king. The Khmer Empire at its beginning was Hindu, but openly adopted Mahayana Buddhism in the 12th century. The Buddha, a Hindu prince himself, was not a religious monolith and therefore Mahayana Buddhism blends all of Hindu beliefs within Buddhist teachings – the divine trinity, heaven/hell (good and evil), the commandments. 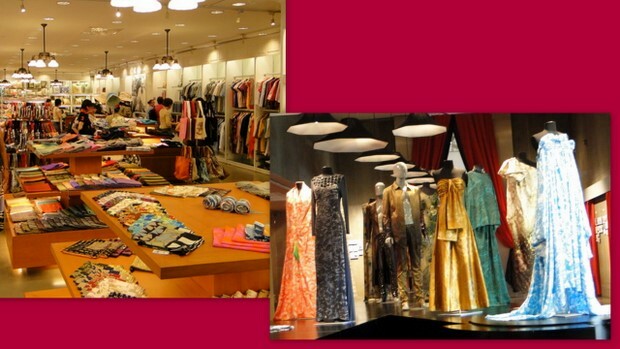 The result is a masterful melange of art and philosophy. By the 14th century the Khmer Empire was under assault by its neighbors, especially the Kingdom of Thailand which succeeded in sacking Angkor Thom. The Royal Court moved south and the jungle slowly overtook 291 of the temples. 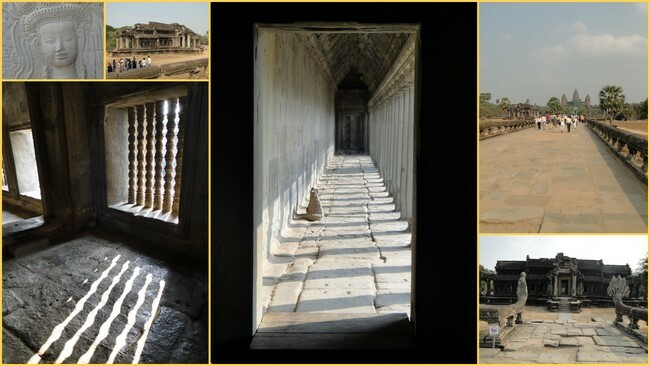 Angkor Wat was, for the most part, spared that fate due to the diligence of the Buddhist monks who refused to abandon the complex even during the horrendous events of the recent Southeast Asian wars. 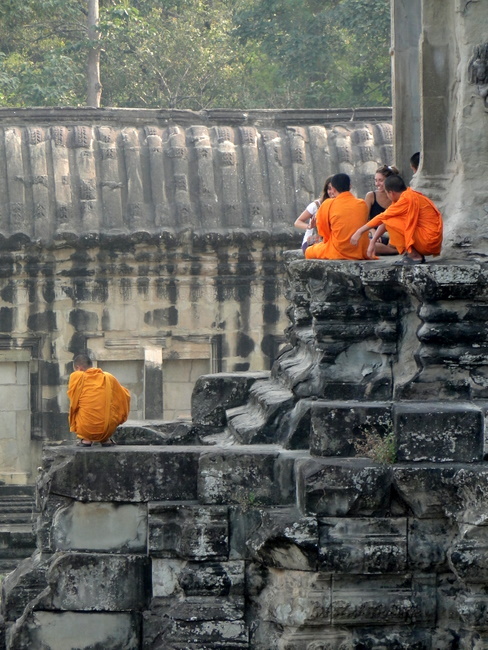 Angkor Wat today is an active temple with two Buddhist monasteries – it is “Mecca” for Mahayana Buddhist monks. 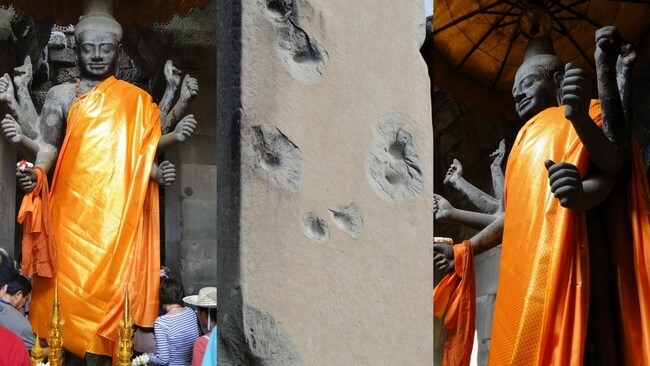 UNESCO World Heritage status and on-going restoration projects (currently being conducted with Japanese and German funding) once again are making the temple the focal point in Khmer culture it enjoyed in the 12th century. Angkor Wat is a fitting symbol for both the Kingdom of Cambodia, which is enjoying its longest period of peace and stability (20 years) in centuries, and the resilience of the Khmer culture. It’s been a quarter century since peace finally came to the lands of Southeast Asia. 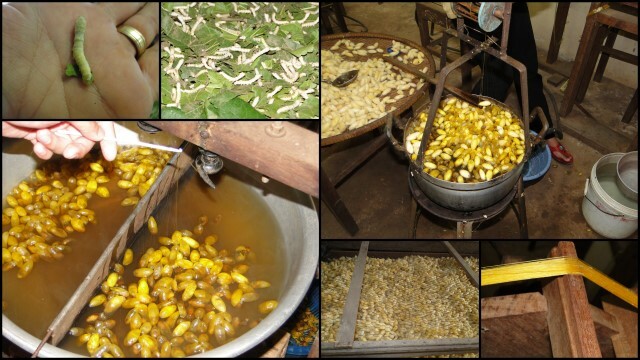 For centuries it was part of the fabled “spice route” between the eastern and western worlds, yet in the 20th century more than twice the tonnage of bombs were dropped on Indochina than in all of World War II. 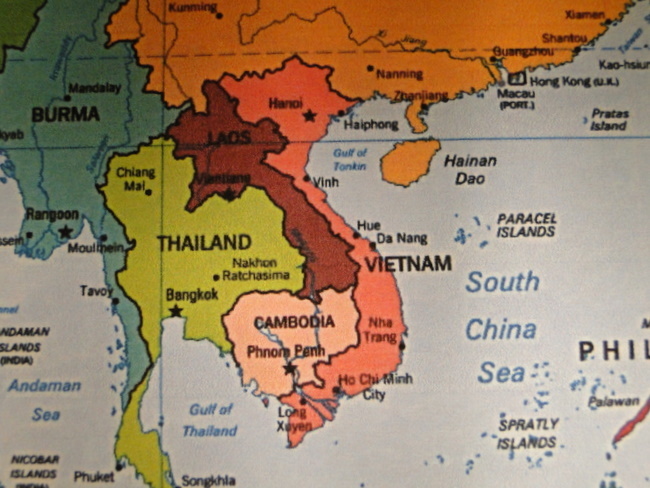 I’ll be leaving Sunday to spend 43 days in Thailand, Cambodia, Laos and Vietnam. I’ll have no worries or fears, unlike the brave but misled soldiers of that ill-fated war. For me who narrowly escaped experiencing the horror of those past times, it feels odd that I’ll enjoy first class hotels, renowned cuisine, stunning scenery, cities and sites that have survived millennia of wars and legendary hospitality. From all my research of the past six months in preparation for this trip I expect to see, or even feel, little evidence (except in museums) of last century’s strife. 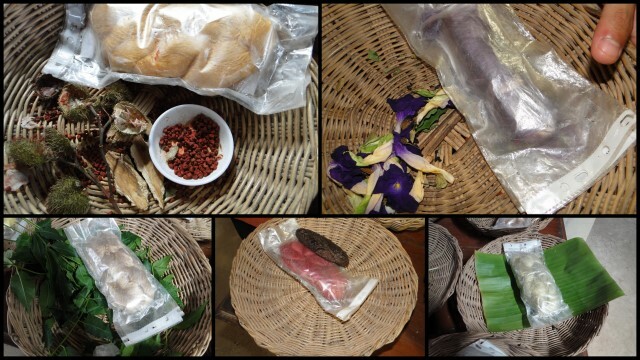 As a chef, historian and travel writer I’m preparing myself for a flood of experiences that will test my ability to process this trip with all five senses – especially taste. 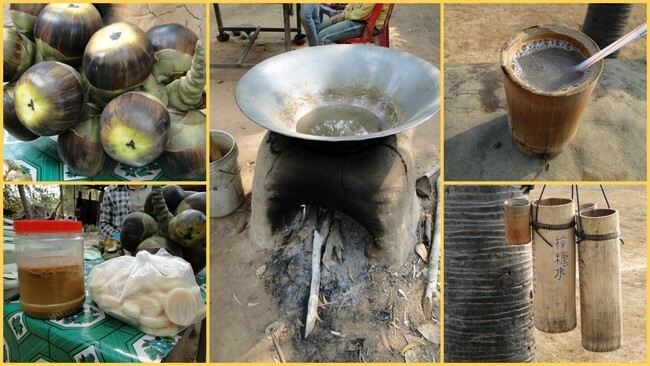 Foods that few westerners ever have the opportunity to see, no less taste, await me, with fusion cuisine developed over centuries of east-west contact – durian cheesecake anyone? 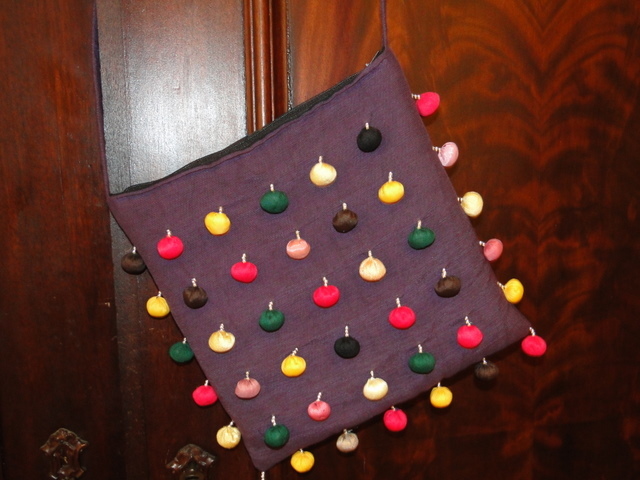 Oddly, I’ll carry some of the same objects listed by Tim O’Brien – can opener (cork screw in my case), pocket knife, wristwatch, mosquito repellant, bottled water, sewing kit and malaria pills (one-a-day for 51 days). I’ll have to still be mindful of bed bugs – carrying bed bug repellant (fortunately I’m already aware of what they look, and feel, like.) Lice, leeches, dysentery are all still present – this is the tropics – which means swimming in lakes and rivers is out. I’ll carry my ignorance of customs – no pointing either with fingers or, especially, with one’s foot. I’ll be ignorant of the languages. For the first time in my life as a traveller I’ll be hopelessly unaware of what anyone is saying (with the exception of tourism workers that speak English). Language will become music, much nicer than the karaoke sounds my research says is the favorite throughout all four countries. The best thing I’ll carry? A sense of wonder. 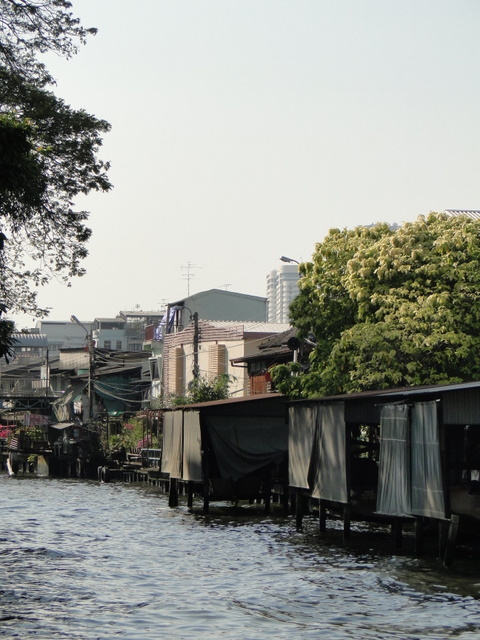 My first blog, from Bangkok, will post Tuesday, 8 February.